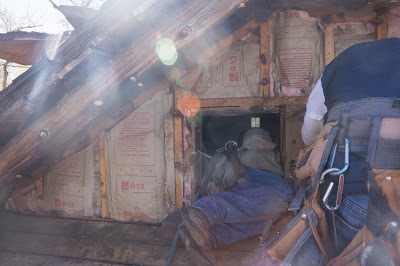 2" holes are drilled though the deck to allow air to draw in from below the eaves. After drilling the holes the topside of the holes are covered with metal screen to keep insects out. 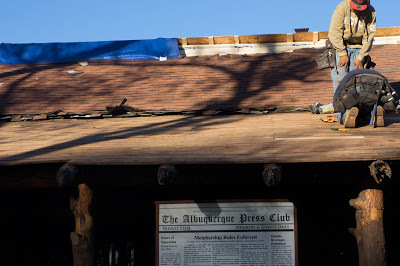 Our historic clubhouse is mostly uninsulated. 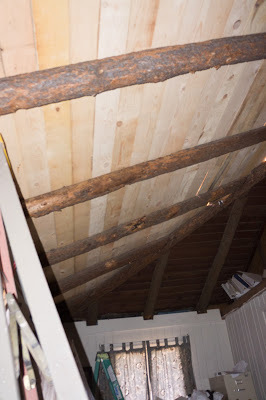 Our Roof/ceiling structure is fully uninsulated. 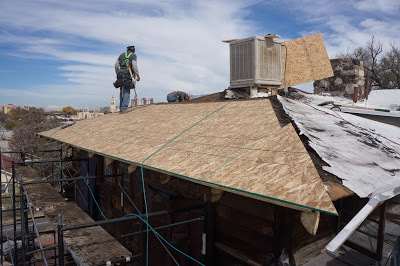 We will be adding rigid insulation to the top of the existing roof deck (so it will not deface the historic allure of our clubhouse) then a replacement roof on top of this. We should be able to significantly reduce our energy consumption while increasing the comfort of our building with this renovation project. 12/17/2012 We have a building permit. We will start ordering materials for the project. Many of the materials are not available off-the-shelf locally. The project is underway. Jonathan (our manager) assisted Thom in setting up the scaffolding at the rear of the building. 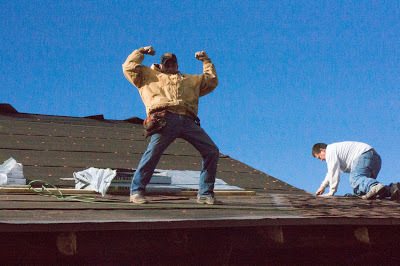 The Construction work is being done by: Top Notch Custom Builders, Inc. 505-401-6180 Chris, the owner, has been working for me for 15+ years (I, Thom, am a retired homebuilder). 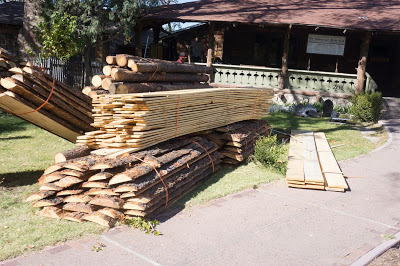 Rough sawn lumber to repair the damaged decking, first cuts to repair and replace siding, vigas and beams all delivered. A big thanks to Jonathan, the club manager, for finding a source for the bark-on first cuts and vigas. 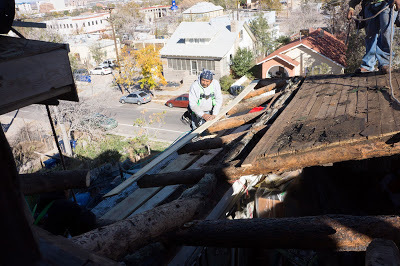 Relocating the lumber to the roof and the side of the building. 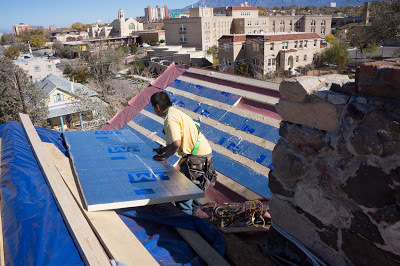 Up on the front porch, behind the protective fencing, stacks of rigid insulation for installation on top of the current roof deck. 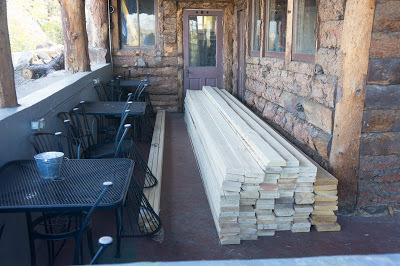 More lumber for the framing portion of the project stacked on the lower porch. Part of this project is restoring the office space back to front porch space. To do that we are moving the office up to the abandoned bathroom adjacent to the board room Here one of the workmen is removing the concrete shower pan. 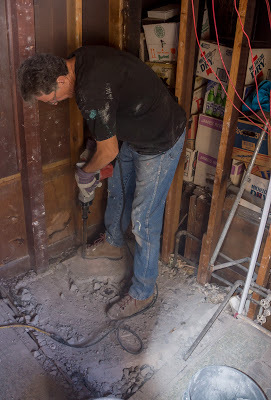 The floor was raised 8" to accommodate the plumbing (disconnected in the 1960's) and is not being lowered back to it's original level. 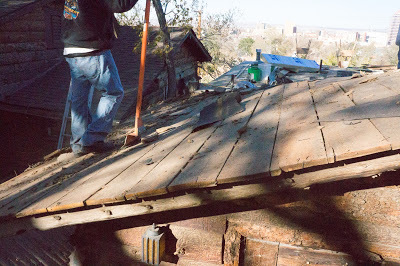 Tearing off the old roofs. 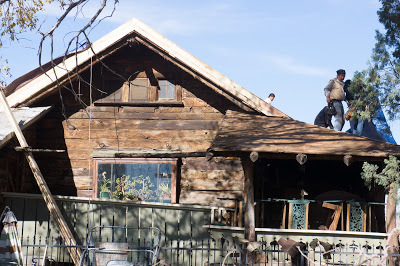 There were 5 layers of shingles and rolled roofing to remove. 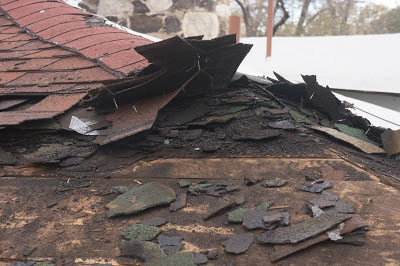 There was a layer of horsehair insulation then: Tan 3-tab shingle Green T-lock shingle White T-lock shingle Green Roll Roofing White Roll Roofing Tan Architectural Shingles The original roof was probably wood shingles, probably removed and replaced by asphalt shingles as early as the second or third decade of the 20th century. 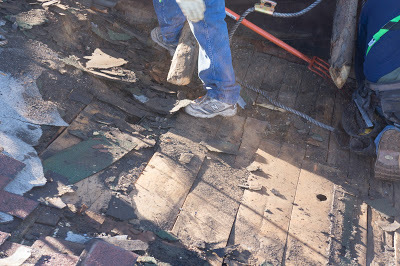 The lower deck board was rotted at the lower edge. It was removed. 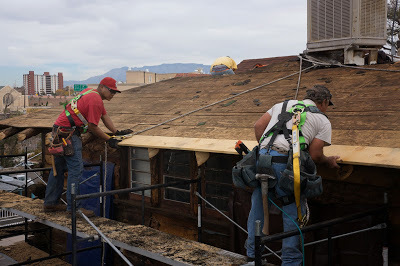 After removing the bottom rotted board the viga's were trimmed to remove the rotted end and to shorten so they would not project out beyond the bottom deck board. This should protect the vigas, slowing future deterioration. 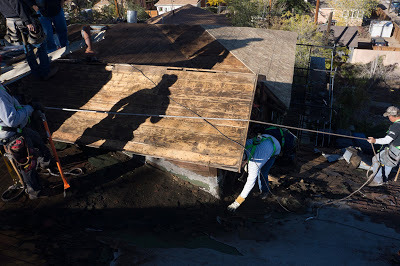 Then a new plywood deck is added on top of the existing rough sawn boards. 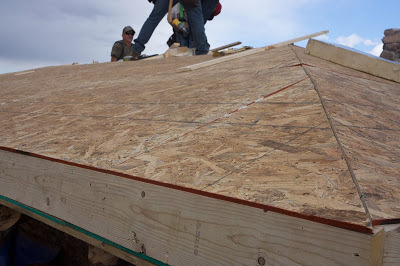 The plywood is run vertically instead of the normal horizontal in order to add strength to the eaves which are unusually large and supported only by the vigas which are on 30" centers. The roof deck in this area is a mess. 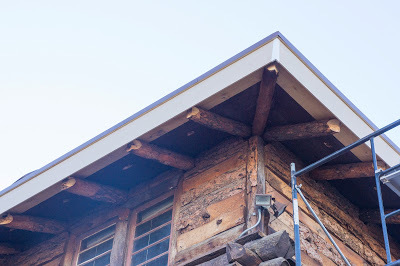 This is the roof above the (former) office area, to become front porch once again. 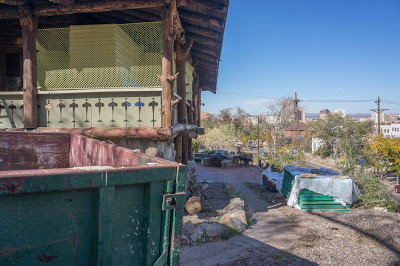 The way the existing roofs tied together right below a valley resulted in regular rainwater intrusion which rotted the decking and destroyed the viga below. All the decking on this section will be replaced as will the damaged viga. The ropes are part of the safety harness system the men must wear. 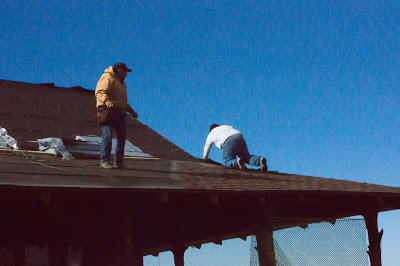 Fall protection is not just a good idea, it's the law. 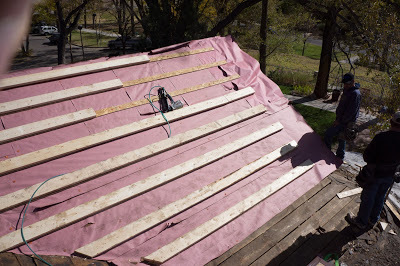 After stripping the roof then adding a plywood deck 2X6 strapping was installed on 1/2" plywood pads. 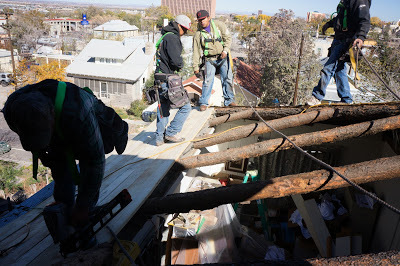 The strapping is nailed solidly through the decking into the vigas below. 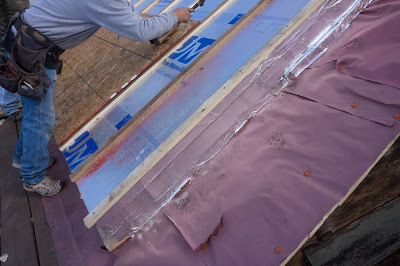 Then rigid insulation is installed to fill the gaps between the strapping. 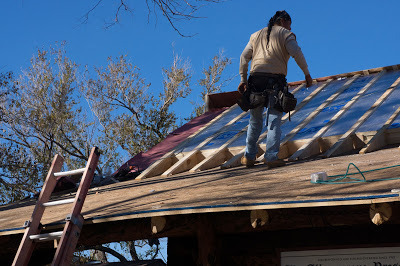 The open area at the lower portion of the roof is the area above the eaves where no insulation is needed. 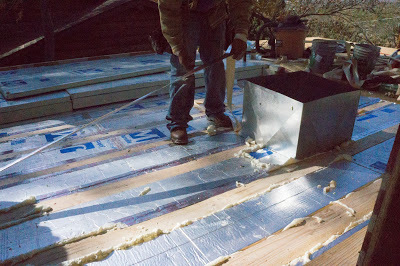 A 4" layer of rigid insulation is installed on top of the strapping and 2" insulation layer to provide insulation to the area below. 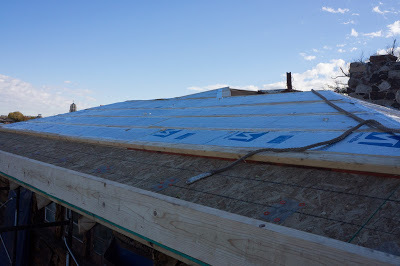 1X3's are installed on top of the rigid insulation with 7" screws going through the 1X3 then through the 4" rigid insulation, into the 2X6 strapping. The spaces between the 1X3's will provide ventilation space for the roof. 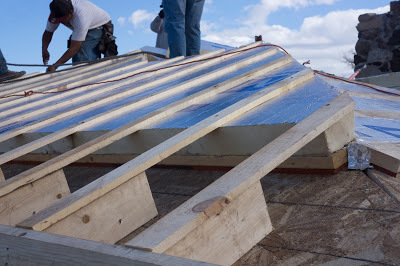 Foil tape will be installed on the exposed edges of the insulation. 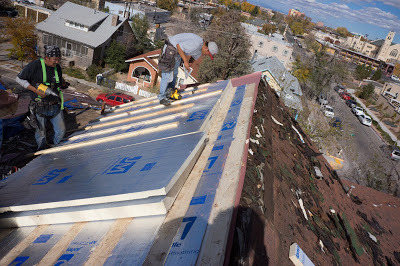 The foil tape has been attached to the exposed insulation edge, it is now ready to install the new roof deck. 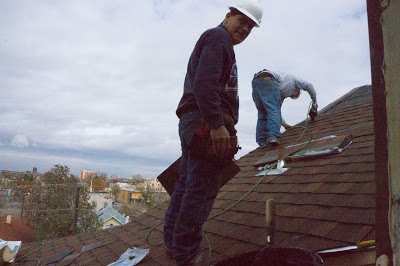 A new roof deck is installed, nailed to the 1X3's. Finished fascia board is installed on the sub-fascia to hide the ugly framing, then a 1X2 drip edge is installed at the top of the fascia with a metal drip edge flashing installed over that. The new fascia projects a little beyond and a little over the vigas providing some protection against future weathering. The fascia will be painted dark brown when the temperatures permit, probably spring. We will probably prime and paint the cut ends of the vigas to provide additional protection. 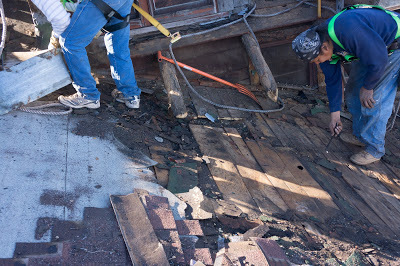 The decking and one of the vigas in this area needed to be replaced so, we removed it all. This is the location that was originally front porch (NW corner) then converted to a room that the APC used as an office. A topside look at the area that was repaired over the "office" area. The rotted viga has been replaced and the workmen are starting the installation of the new decking. The rest of the old decking will be removed as work progresses. All of the decking on this section was replaced with new. 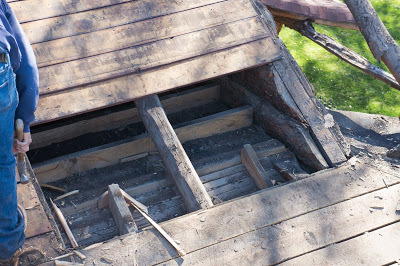 More than half of it was damaged from rot, a direct result of a terrible roof design/construction. This design problem has been eliminated as part of this project. After all the decking was replaced, a layer of plywood is overlaid to stiffen the cantilevered lower edge. 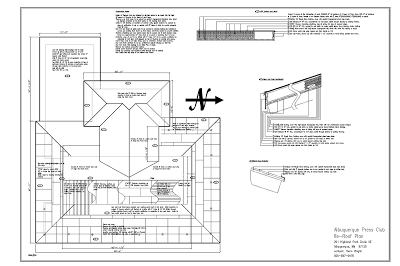 The entire lower roof area (porches) will get the full overlay. Meanwhile, work is progressing on the new office, the room that was a former bathroom, decommissioned decades ago, on the top floor. Soon this room will be ready for use as an office. After the move, the existing office area will be restored to porch area. WHO KNEW???? 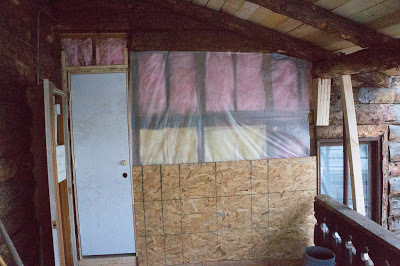 There actually was insulation on the roof over the front-room. 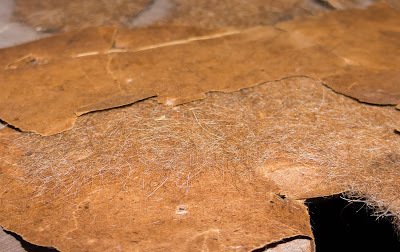 This is two layers of thin oiled paper with about 1/8" (uncompressed) horsehair(?) sandwiched between, all sewn together. Compressed, the insulation is about 1/16" thick. 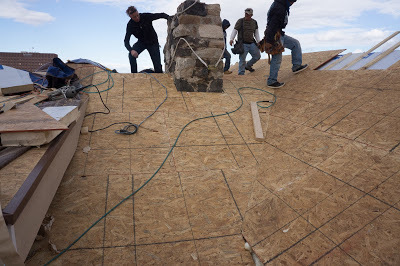 This insulation was installed on top of the decking prior to the installation of the first layer of asphalt roofing (shingles). I will try to get a decent condition piece of this to frame with an explanation, and hang it on the wall by our historic photos. 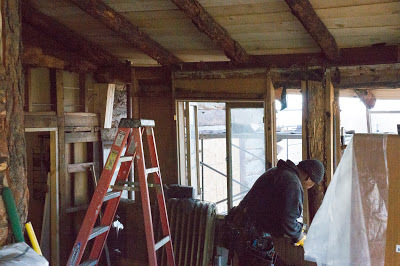 The 2X6 strapping is installed on top of rosin paper over the NW frontroom. The ceiling in the frontroom will be removed at some point in the future and we don't want the foil on the insulation boards to show through. 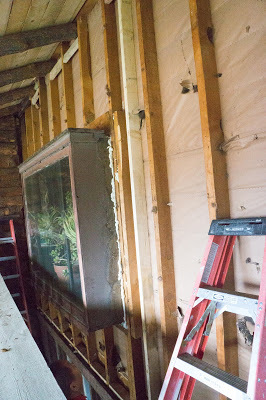 Then the gaps between the strapping is filled with insulation boards. After the fill is finished another 6" of rigid insulation is installed on top. This is the NW side of the front room. 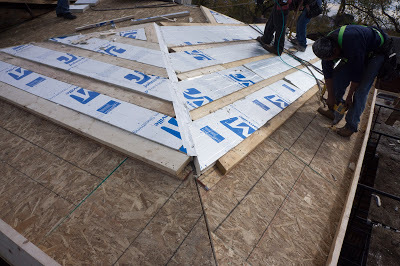 9" screws go through the 1X3 top strapping, through the 6" rigid insulation, into the 2X6 strapping below. 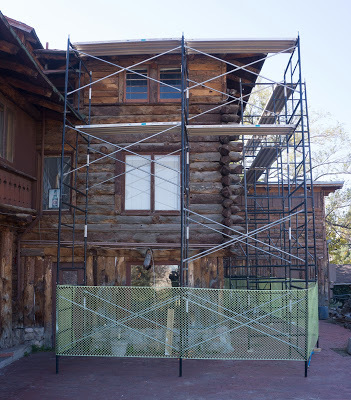 The 2X6 strapping is nailed through the old decking into the existing vigas. 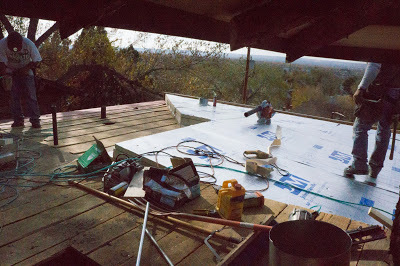 Meanwhile, back on the SW side of the frontroom roof, we found some damage when we removed the many layers of shingles. 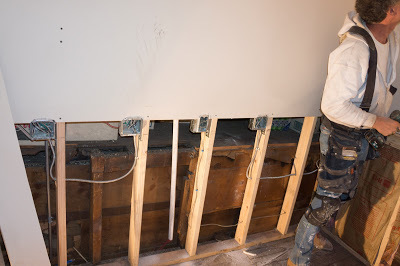 The damaged boards were removed and replaced with new ones. 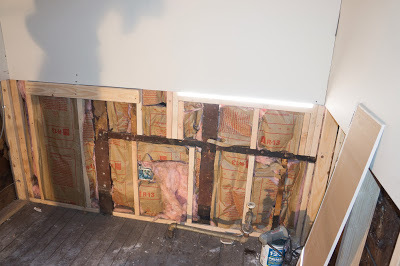 After patching, the rosin paper was installed, then the strapping was installed then the fill insulation. 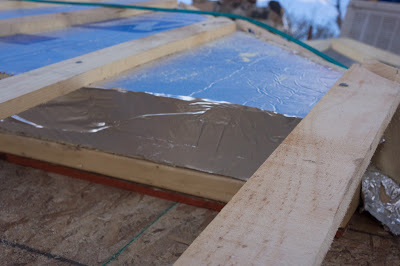 foil tape is installed, covering the raw insulation where it will be open to the ventilation air. 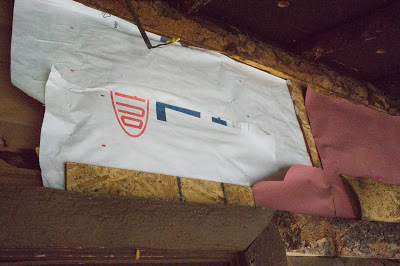 The 1X3 strapping is installed on the SW side of the front room. 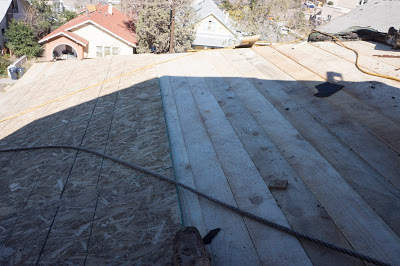 finishing up the plywood deck on the SW front room, more insulation will be installed below, over the flight deck. 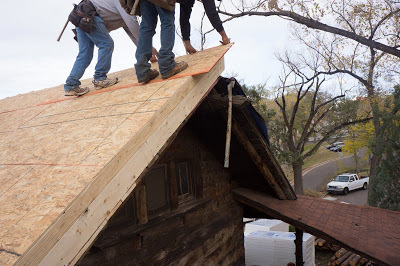 A fascia board and a drip edge will be installed on the gable ends. 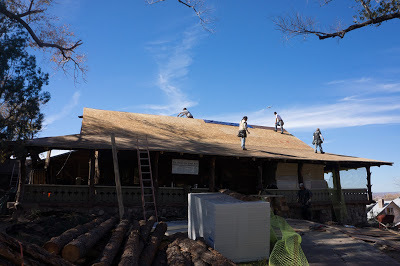 The guys are finishing up the new roof deck on the south face. 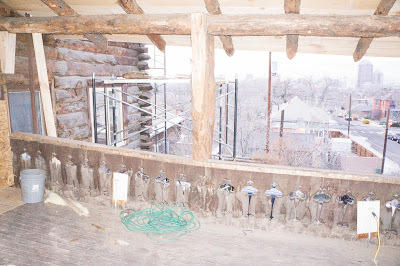 The area around the stone chiminey is to convoluted to cut the rigid insulation tight so that area was filled with expanding foam insulation. North Front Room Gable End. 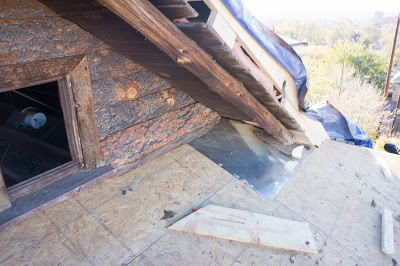 The swamp cooler is removed, the log siding is removed, insulation is installed in the stud cavities. 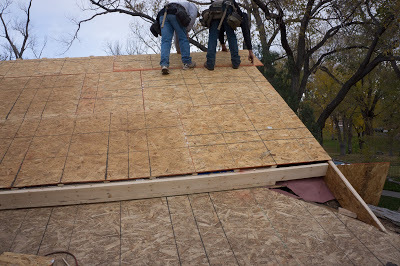 Plywood sheathing has been installed, house wrap on top of the sheathing, then log facing is installed. 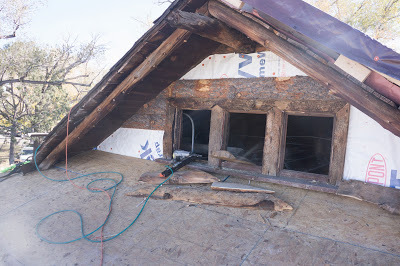 The log facing is finished, 6X6 flashing was installed behind/under the bottom course, sheet flashing was installed to seal the corner and under the eave. 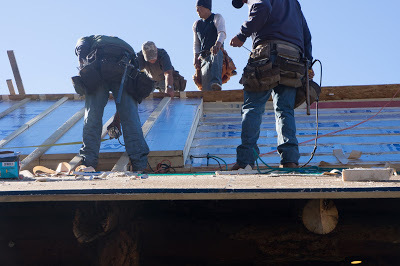 Sheet flashing is installed at the other side. The next step will be to install fascia board and drip edge. The windows will be boarded up for now but real window sashes will be installed when we open up the frontroom ceiling. Meanwhile the guys have torn off the roofing over the front porch and are repairing/replacing damaged sections of decking. Cutting out another broken piece. 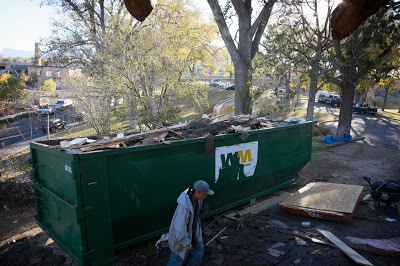 This is our second filled dumpster, a third will be delivered this morning. 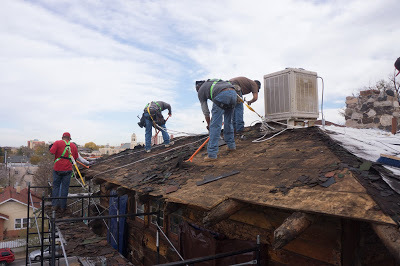 They stripped then cleaned the front roof, patched as needed, installed the lower plywood, installed the rosin paper, the 2X6 strapping, infilled the strapping, and are now in the process of installing an additional 6" of rigid insulation and the 1X3 strapping. Finishing up installing the lower strapping supports getting ready to sheath with plywood. 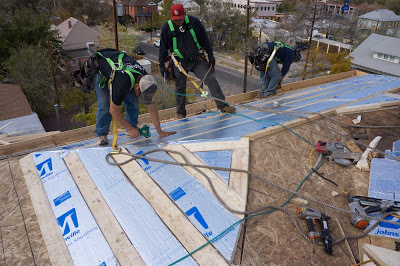 Sheathing the front facade over the rigid insulation. 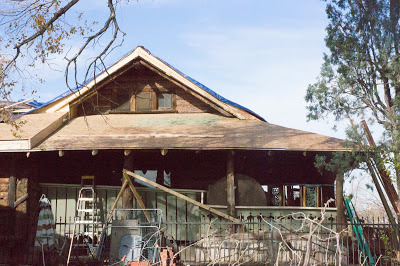 The roofing is removed from this SE porch section, this may be the last photo of this view of the porch. This is a crop of the above photo. Notice the "viga" slots in the siding below the windows? 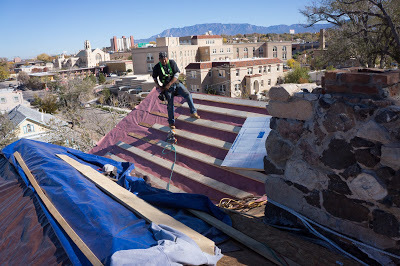 We will be reconstructing the roof in this area, new vigas, new decking, restoring the historic look. 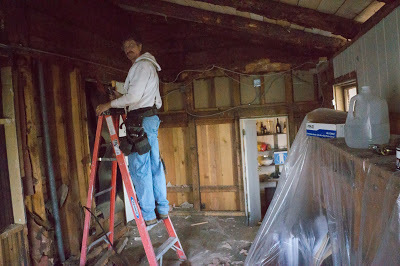 Throughout the project John Gilpin, one of our long-time members has been volunteering his time to assist in the clean-up. 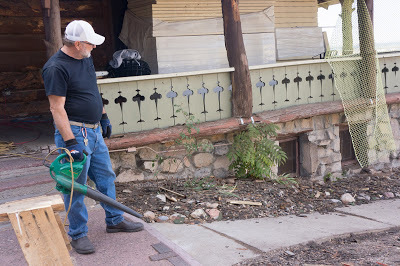 John also removed piles of weeds from our property and the circle out front. The forked log post is set on it's new concrete foundation so the log beams can be installed. 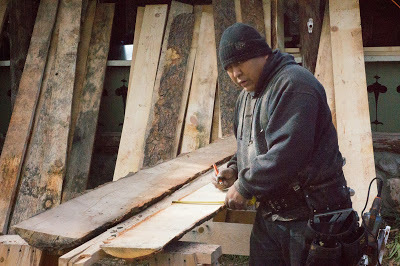 One of our carpenters is finessing the log into place with his trim hammer. 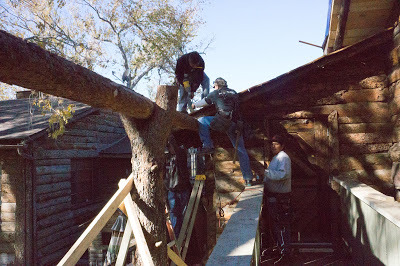 Then, they install the second portion of the beam. 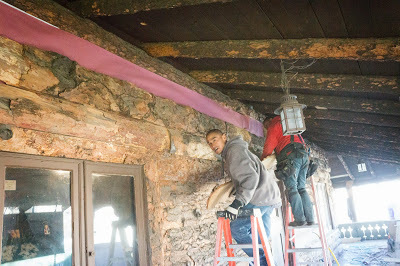 This is set into the existing beam pocket where the previous rotted one had been removed. 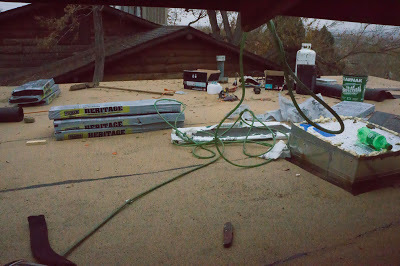 Meanwhile, the rest of the crew is preparing the deck over the "flight deck" for it's insulation and new roof. This area will receive 8" of insulation. 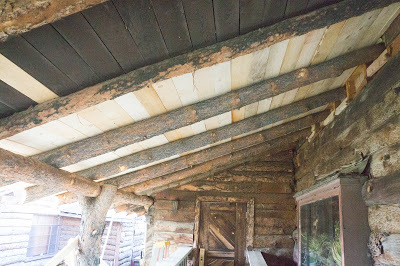 The decking on the porch roof rebuild is finished. A layer of 5/8 plywood has been installed over the rough sawn decking to stiffen the lower edge. Notice, on the left, the roof gets considerably thicker. This is the area over the flight deck where 8" of insulation was added. 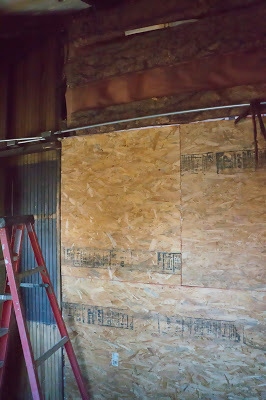 The roofing over the bar and restroom area has been removed, the strapping and insulation is being installed. The galvanized ducts on the restroom vents has been extended, we will be doing something similar with the cooler ducting. When the cooler was installed the conduit to the lighting and exhaust fan was damaged but left in place. The damaged conduit has been replaced. The bar area is a reconstruction of a portion of the building that burnt back in 1973. 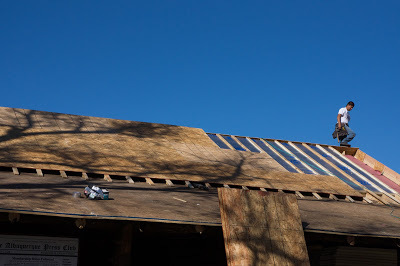 This is the only portion of the building that had any insulation in the roof/ceiling structure, it was insulated with 2" of fiberboard giving an R value of 5. We replaced the fiberboard with 8" of foil faced polyisocyanurate giving us an R value of 57. 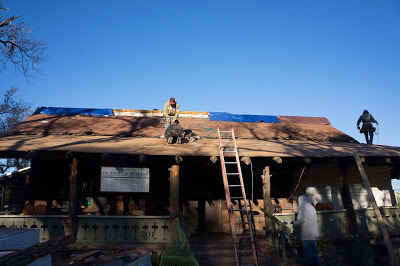 The roofers are at work, the bar area is roofed. The shinglers are doing their thing. Meanwhile the old office area is being torn apart. The new office is upstairs, adjacent to the board-room in what was once an abandoned bathroom. Jonathan and Cliff had to disassemble the desk then reassemble it in the office because it would not fit through the doors. At the same time we are preparing the window jambs for new sashes in the green room and the card room. We will also be getting new windows in the new office and the south side of the board room. 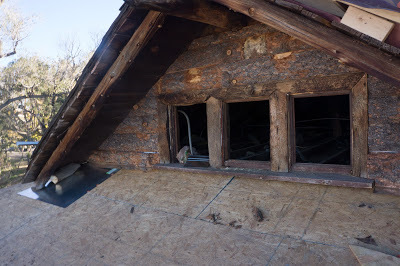 This area has been insulated then sheathed with osb, now the top log siding is being removed so this area can be insulated, sheathed, and re-sided. 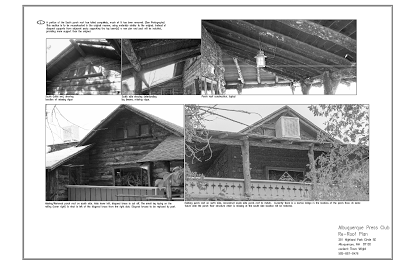 Of note, the top log siding is not being removed, the vigas rest on it. Seems like a strange construction practice. The shinglers are working their way around the building. 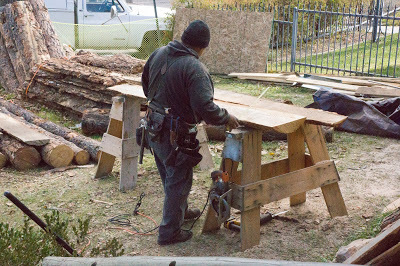 And another of the carpenters is taking the first cut slabs and squaring them up so they can be used as siding. As they come off the log, they are wider at one end than at the other. The slabs must be trimmed on both sides so the two sides are parallel. 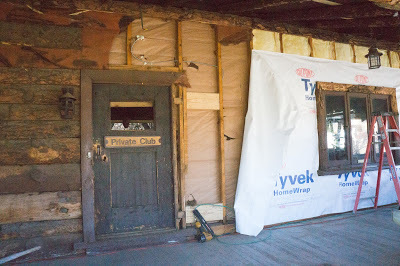 The old paneling has been removed from the east wall of the previously enclosed porch area (old office), framing has been modified as needed to support plywood, the plywood is installed with house-wrap under it, ready for log facing. 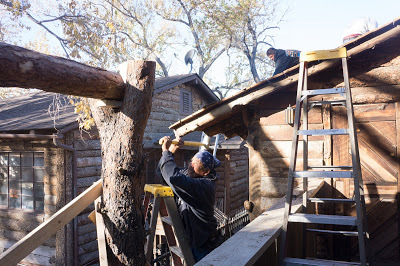 The log facing is being installed on the east wall of the former office. 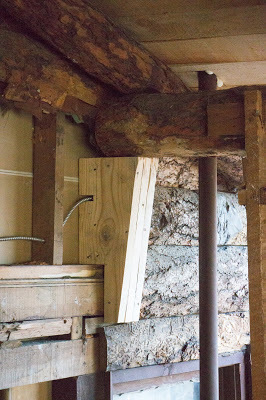 The log beam end at the north-west porch, at the location where the beam intersects the building. 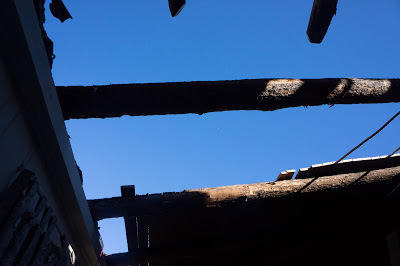 The beam was never properly supported. We added structural support for the beam. 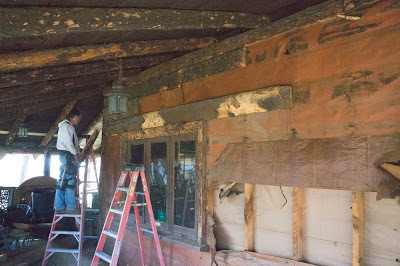 The old exterior walls from the enclosed area of the porch are being removed. 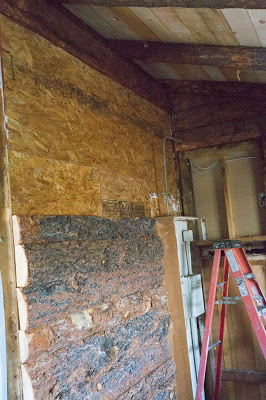 On to the North wall of the front room, remove all the log facing, insulate the wall, add plywood sheathing, then put the log facing back on. 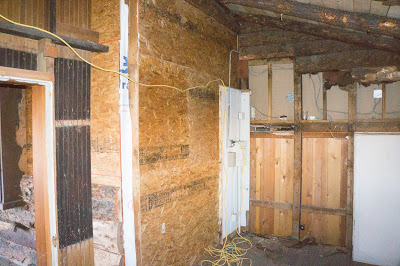 The North side of the frontroom east wall has been removed, framing modified, insulation installed, house wrap installed, ready for plywood sheathing. 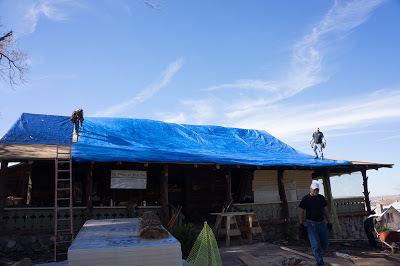 The plywood is installed over the house-wrap then rosin paper is attached to the plywood, then the log facing is re-installed. 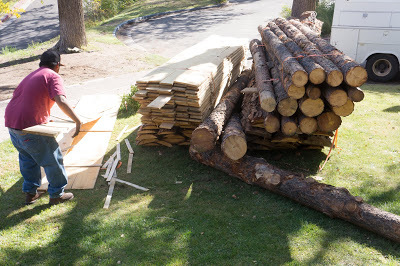 Removing the log facing from the South side of the front. 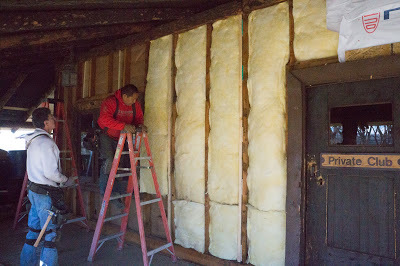 After modifying the framing to allow for the proper installation of plywood the wall is insulated. Then, On to the South wall of the front room. Then. 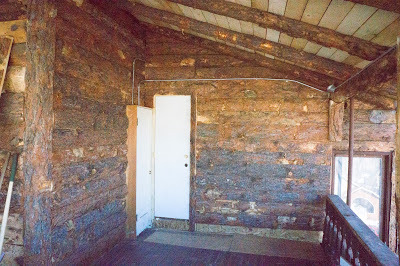 the wall between the porch and the building on the NW corner. This about wraps up this end of the project. 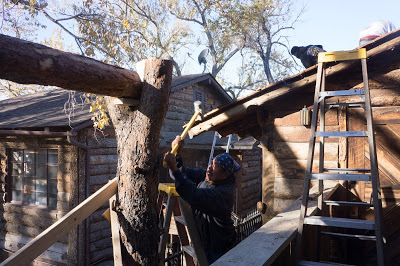 The last (bottom) piece of log facing will be installed after the porch foundation project is complete. We still need to add a layer of flooring. Those two doors? The door on the left has an electric panel inside the door. This electric (sub) panel is on the old wall paneling. This is the source for the power in the front room, the porch, the upstairs card-room and ???. The door to the right is for passage to the front hall/flight deck. This will be on a hall through the existing store room. This is a future project. And one more problem to deal with. The porch at the NorthWest corner has dropped 9". 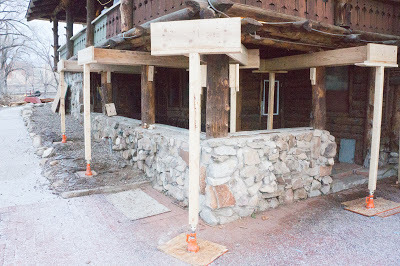 The Lower posts which are buried in the stone wall below are failing. This is also a future project. Unfortunately, we must repair this problem quickly. We have set up temporary supports and jacks to bring back some of the lost height and to provide support for the porch/roof structure while we construct new foundations for the posts. This will take time. The building must be jacked up slowly giving the structure time to properly move back into place. Follow this as we do the porch foundation project. And this project is about wrapped up. 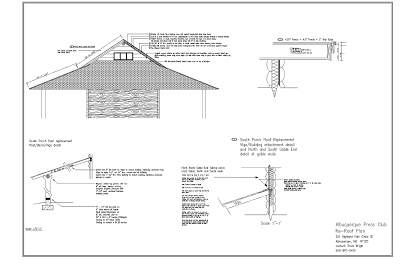 We now must move on to the porch foundations project, the evaporative cooler project, and the front room ceiling project.